When moving homes, it is important to learn how to properly prep, move and store a washer and dryer. There are many reasons why you would want to store your washer and dryer. For example, your new home may not come equipped with them, or you may have just purchased a new pair and want to bring them with you. It’s possible that you are downsizing and need somewhere to temporarily store your washer and dryer until you need them again. As perhaps the most expensive appliances you own, you want to make sure your washer and dryer last as long as possible. We’ve compiled a comprehensive list of tasks for prepping, moving, and storing your washer and dryer. Before you even think about moving and storing your washer, you need to ensure that it is properly cleaned and drained. Failing to prep your washer beforehand leads to mold or rust that could cause lasting damage. Follow these steps to prepare your washer for storage. With your washer empty, fully run a hot water cycle. Add ¾ cup of vinegar to help rinse out any residue left from detergent in your washer. Before you do anything else, find the water valve shutoffs and the electrical breakers for your washer. Ensure they are both shut off completely. Next, carefully disconnect the water supply hoses. If you are unsure of how to do this, look up tutorials on YouTube, read the user manual, or contact a professional. Residual water or moisture can sit in your washer while in storage, causing mold and rust. Make sure to thoroughly wipe down the machine after it has drained. You should leave the door to the washer open for a minimum of 24 hours before your move to dry out any additional moisture. Take a damp cloth and wipe down the inside of your dryer to get rid of lint, dust, and any other residue. Run back over with a dry cloth to soak up moisture and pick up remaining dust. Remove lint traps from your dryer and remove any lint. Then, soak the lint trap in a warm mixture of water and soap to thoroughly clean it. Find the gas shutoff valve and electricity breakers for your dryer and shut them off. Then proceed to disconnect the rest of the dryer, putting any small pieces in a labeled bag. Knowing how to properly move your washer and dryer will ensure that they stay safe from damage during transit. If you are uncomfortable moving your washer and dryer on your own, hire a reputable moving company to do the work for you. They have much more experience, and will likely have the supplies they need to safely transport them without damage. Even if you do have a moving company, you should be sure to follow these steps. Locate the original moving hardware for your washer and dryer and reinstall them. This hardware is used to keep everything in place to ensure nothing moves around and becomes damaged during transit. If you did not keep the original hardware, contact the manufacturer for replacements. You should also check the user manual to see what suggestions they have for moving your specific model. Make sure to securely wrap your washer and dryer, especially if they are front-loading. Either wrap your washing and dryer securely with stretch wrap or use tape secure the doors. Next, wrap your machines in blankets and foam. This will help protect them from scratches and dings during the moving process. It will also keep things from shifting around and becoming damaged. Load all heavy items into your moving truck first, placing them along the back of the truck. Then, fasten your washer and dryer to the walls of the truck to prevent shifting and crushing smaller items. Loading in first and fastening your washer and dryer it the best way to avoid damage caused by shifting. 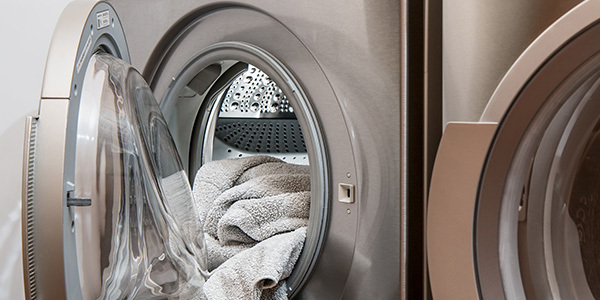 When storing your washer and dryer, you should opt for somewhere with climate control. 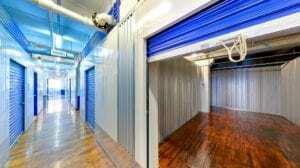 This could be a climate-controlled storage unit or any other location with consistent humidity and temperature year-round. Keeping your washer and dryer in a climate-controlled environment is important to protect them from rust and mold. High fluctuations in temperature can lead to condensation that will slowly destroy your appliances. To further protect from damage, keep your washer and dryer elevated off of the ground. The best way to do this is to place pallets underneath them. Depending on where you are storing your appliances, water and moisture can seep through the ground. The moisture can become trapped and lead to mold, mildew, and rust. Make sure to cover your washer and dryer before storing them. Using a cover can protect from dust, moisture, and damage from other items. Avoid using plastic tarps or other covers that do not allow air flow, as they trap moisture and cause mold. Leave the doors of your washer and dryer slightly ajar to promote air flow. If any moisture does get into your appliances, this will help ensure that it dries quickly and does not cause any lasting damage. Keep your washer and dryer away from heavy objects that could damage them. Do not store anything too heavy on top of the machines, as the weight will cause dents and damage. When stacking items in your unit, do not put anything that could collapse or fall near your washer and dryer. Also avoid storing any liquids near them, in case of spills. Just like your moving truck, store your washer and dryer in the back of your unit. There are a few reasons for this. For one, you will likely not be taking your washer and dryer out of your unit before you are ready to fully move in. On the other hand, you may need to grab a box of clothing or utensils before the full move. You’ll want to keep those smaller essentials toward the front of your unit for easy access, and all larger items along the back. Storing your appliances near the back of your unit can also protect from any rain or other elements when you open your unit. Now that you know how to properly move and store your washer and dryer, the next step is to choose your storage unit. Visit a Guardian Storage near you to talk to one of our trained, professional managers. They will be able to show you different options and determine the unit size and type that is right for you. Having owned my business for 12 years, I know that you can’t cut storage costs in while adding conveniences and amenities. It’s almost impossible. But that’s exactly what I’ve been able to do at Guardian Storage. The convenient, well-accessible location, 24-hour security, conference room, free wi-fi, package-receiving services, and more and have made running, Liquidation Works, my distribution business, simply a breeze. My experience at Guardian Storage has been amazing.